In-form Leicester City midfielder James Maddison says playing for England is his dream after playing a starring role in the Foxes' come-from-behind victory over Huddersfield Town. Maddison combined with Jamie Vardy to set up Kelechi Iheanacho's equaliser and then scored a brilliant free-kick as Leicester snapped a two-match losing streak with a 3-1 home victory on Saturday. The 21-year-old represents England at Under-21 level but has been linked with a senior call-up scoring three times and collecting one assist in his last five Premier League starts, and he would love the opportunity. 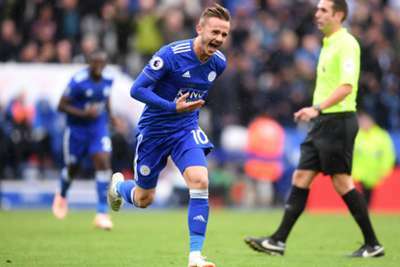 "I don't want to get too far ahead of myself, I love football and I love playing in the Premier League," Maddison said to BBC Sport after a win that saw former England striker Vardy net the hosts' third. "It is a dream of mine to play for England, but I will keep focusing on my form for Leicester. "I go into each game with the same mindset of showing people what I can do and letting the rest take care of itself. "I put a lot of practice into my free kicks on the training ground, and I take responsibility for them, so I'm delighted. "I had a different role [wide on the left] which I hadn't played as much, but it was positive because I can come off the touchline without too much attention from opponents." Maddison's form has delighted manager Claude Puel, who was not sure how quickly the midfielder would adapt to life in the top flight after signing from Norwich City for around £20million. Puel said: "James Maddison improves game after game and he scored a fantastic free kick and I liked the idea for the first one [the chipped throughball to Vardy]. "I want my players to have this creativity to find solutions. We didn't know what he can give at the beginning of the season, he had only played in the Championship but he has the quality to improve with us. "He has a good mentality and he is a good listener. It is important he continues this way." David Wagner, meanwhile, lamented costly mistakes from Huddersfield as they lost the early lead given to them by Mathias Jorgensen to remain winless after six Premier League matches. "We made so many big mistakes in my point of view," he said to BBC Sport. "We got the lead but we gave them presents. We conceded two counter-attack goals against Leicester, and we didn't use our chances in the offensive side. "Apart from that, the performance and the attitude was there. If I compare the gap between us and the other teams, there is not a lot and I can see we are closing the gap in terms of performances and the talent we have."